Aston Martin seems to on the up and up and this is in no small part down to their DB11 models which have helped generate a quarter of a billion pounds of profits. Jeremy Webb examines the merits of the DB11 and looks at what Aston Martin has planned for 2018. March 1st means new car registration day, and many people buying new models. If you have £160k Aston Martin have the new Super GT DB11, now as a Volante. Luxury motoring with the your top down, the car that is. A beautifully crafted folding canopy offers full protection from the elements when up, including excellent sound proofing. This is a beautiful convertible, that can propel you to 160+ mph, in total comfort and safety. The 4-litre twin turbo V8 produces 510PS, using its 8-speed automatic transmission to smoothly transport the car along under total control of the driver. You have a paddle shift on the power-assisted, heated steering wheel, and a choice of driving and suspension modes to suit the road conditions and your mood. The DB11 Volante exudes luxury with its fine leather seats, beautiful interior in colours of your choice and superb entertainment system. The hood is electronically operated from a button inside the car or remotely from the key. It takes 14 secs to open, 16 to close. Both operations are super smooth as you would expect. The car was thoroughly tested in weather chambers and also real-world locations such as Death Valley and the Arctic circle. The new car has more boot space then the DB9 Volante it replaces, making it the true Super GT allowing 2+2 trips in style. The perfect car for burning off autoroute mileage then top down cruising on the Grand Corniche. Aston Martin’s CEO Dr Andy Palmer stated: “ The new DB11 Volante captures promises the kind of pleasure and enjoyment that can only come from driving an open-top Aston Martin. ” The DB11 Effect There is a lot of positivity coming out of Gaydon at the moment. The manufacturer recently announced they had generated a quarter of a billion pounds of profits, completely reversing the pre-tax loss of £163m in 2016. They’ve also had their highest unit sales in nine years and this was driven by demand for their DB11. In addition to sterling financial results, Aston Martin is planning to expand its manufacturing footprint with the construction of a new plant at St Athan in Wales, due to open in 2019. They’ve also resumed production of specialist models at Newport Pagnell for the first time in 10 years and some of this will be on display in Geneva. Aston Martin at the Geneva Motor Show Aston Martin at the Geneva Motor Show The recently launched DB11 Volante together with the DB11 Coupe will be on display at the 88th Geneva Motor Show. This will be the very time the DB11 and the new Vantage have been shown collectively. 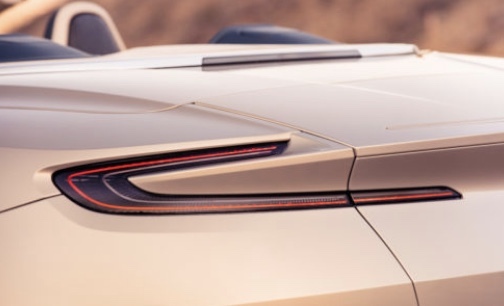 ...Copyright (C) Luxurious Magazine® http://www.luxuriousmagazine.com/2018/03/aston-martin-db11-volante/ .